3900 uF? That’s like, 3.9 mF!! Really? You’re going to respond to something THAT old (and obviously a joke) with something THAT lame? Neat, but a good slingshot has about as much damage capability as that does. I think I would have used a boost converter to charge though. Looks awkward to hold with the capacitors there. I’d have gone with side of the barrel. Which would be awkwardly front-heavy, but at least it’s not getting in the way of your arm. Rate of fire’s kinda low. How about an electrified bayonet to compensate? 4x 3900uF? That’s over 9000! (yes, farad, as in 300,000,000uF). Also have some 5000F caps.. One of these days I’ll make an ultracap railgun..
Show us what it’d do to a block of balistic gel. Is it just me, or does this guy remind you of Sid from toy story? I’m poor so I’ll just have to use about 50 of the low-capacitance 2100V caps I got lying around the shop. I’ll make the charging circuit out of TV components (flybacks on those are bitchin’) and part out some transformers from commercial microwaves; then just use some of the nossler ballistic tip bullets from the gun shed as ammo. Not even the trolls could say that wouldn’t be a hack. What’s the ESR on the caps. Most high farad caps have a high ESR that will limit the output current of the cap. Hockeypucks are the way to go. Just need to devise a clamping mechanism for them. Also I think fewer turns of heavier wire for the coil might be better. I wonder how long it is actually firing for. need to test on bellistics gel. THIS IS INCREDIBLY DANGEROUS!… I love it. This would be perfect with a mechanical injector; perhaps a pair of spinning wheels that inject the projectile into the coil, and a sensor that triggers the coil at just the right moment. @macona the 350F has 2.5 mOhm and the 5000F has less than 0.25 mOhm. Yeah you don’t want to mess with the big ones. heh. Torvaun: Have you ever fired a bullpup rifle? The magazine is in the same position as the capacitors (if I have it right; they’re the big blue things in the stock, right?). The magazine on a bullpup isn’t in the way of anything. This setup looks fine to me, and I love the look of the build. Could use it to infiltrate a scifi convention, dressed up like a generic space marine, and off a nerd you don’t like. 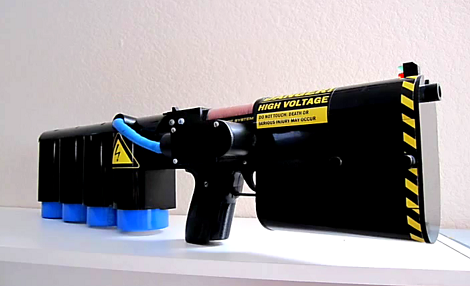 Has anyone ever tried a two-stage electro-mechanical gun? Like taking the spring action mechanism from an airsoft or bb gun and adding a coil to the barrel? Would get a much more potent shot if the projectile was much smaller. So much energy is being expended to make a massive projectile travel relatively slowly. A projectile a third of the size as currently being used would make a dramatic improvement to velocity and impact force. Alex: I’m not very good with electromagnetism, but I suppose projectile has to be sufficiently large to be properly accelerated. Break skin? These things should be built as lethal as possible. Right form factor and you should have a billion dollar contract on you hands in no time. You’ll never see me putting those caps under my armpit, I’ll tell you that! If you put a piece of neodymium in that projectile from a dead hard drive the projectile would become leathal. BobSmith: Are you suggesting we use the rear of the capacitor setup as a shoulder stock? It doesn’t really look like it’s got the stability/sturdiness for that.